Most women begin planning their weddings as little girls, running around the house with a pillowcase for a veil, pretending to be a beautiful bride. Seemingly insignificant details like flowers and cake flavors and place settings can become incredibly important factors in making her day perfect. So it is often easier for men to adopt a hands-off approach to the wedding planning. Keep your distance. Let her have whatever she wants. As the groom there is only one decision that you cannot avoid, and your choice in the matter will stay with her forever: you have to pick the ring. Proposing is the first big step, and you want to make sure that the engagement ring sets the perfect tone and suits her taste. The problem is that there are nearly as many rings are there are women in the world, and it can be incredibly difficult to choose. If you’re looking for a high-quality designer ring with a rich history and brilliant reputation, consider a ring from Cartier. Cartier is a jewelry company known internationally for its exquisite luxury diamond jewelry. Louis-Francois Cartier started his legacy in Paris in the early 1800’s, and the company expanded to four branches in France headed by four brothers. It was a time of great advances in design and production for technique, and the Cartier Company established a reputation for having a distinct style. Although the company is most well-known for its watches and luxury items like cigarette cases, it entered the bridal jewelry market in 1847 and was one of the first jewelers in the early 1900’s to being using platinum for engagement settings. Cartier boasts clients from royal families all over the world, as well as celebrities like Marilyn Monroe and Elizabeth Taylor. It was the Cartier Company that owned the Hope diamond before it was donated to the Smithsonian museum in 1958. The company is even mentioned in the song “Diamonds are a Girl’s Best Friend.” These rings are truly a level above the rest. Each ring is a work of fine art. The minimum diamond size for a Cartier ring is half of a carat. Only the highest quality stones are used, and they are carefully selected for cut, symmetry, and brilliance. Also consider purchasing conflict-free diamonds. This is a certification that ensures that the diamonds used in your ring are mined in an environment where workers are treated fairly and the purchase of the gems does not finance any violent groups. With the rise in awareness concerning so-called “blood diamonds,” this is an important detail to consider so that your bride can feel good about wearing the ring on her finger forever. Choosing the style of the rings includes determining which elements are in style and which elements are specifically her preferences. While you should not focus too much on what is trendy (after all, you do not want it to be dated in 20 years), you should consider some trends. For example, gold jewelry is no longer in style. White gold and platinum are considered to be higher-end metals for engagement rings, so most Cartier rings will reflect that trend. Rounder-cut diamonds are also more common than pear-shaped or otherwise irregular-shaped diamonds. In trying to determine her preference, look at other jewelry items she already owns and wears often. Cartier offers rings in both classic and modern designs. Does she prefer simple, clean lines or a more antique look? Cartier designers blend modern trends and historic legacy to create unique and distinct rings. Art deco engagement rings are coming back in style. Balance is the key in design, so choose a ring that looks proportional by itself and as compared to her other jewelry. If she is comfortable wearing a good amount of jewelry, she may appreciate a ring with multiple accent stones or a pave setting. However, if she prefers to keep things simple, then you may choose a classic diamond solitaire engagement ring with a prong fixture. Also think about how the ring will look from your perspective as well as hers when it is worn. Getting her ring size without asking her straight-out is as much of an art as choosing the ring itself. You may try to size another ring that she wears occasionally, but take care to note that her right and left rings fingers may vary in size. Fingers also swell and shrink depending on the weather, so measuring on a hot day may throw you off. Asking a friend for help or measuring together may be the best method, and it will ensure that the ring will not have to be resized. With a Cartier ring, she will want to show it off right away! The inside of each ring also comes with a distinctive Cartier engraving. You should definitely consider a Cartier ring to be an investment for the future. Cartier rings achieve top quality in all of the areas of the four “C’s”: cut, color, carat, and cost. A solitaire ring may run you upwards of $17,000. 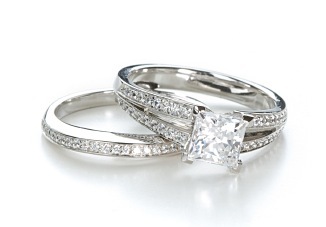 Of course, the price of each ring varies depending on the complexity of the design and the quality of the diamond. Many couples choose to start with a smaller-sized diamond and then replace it with a bigger one for a later anniversary. As the first step in the process of getting married, purchasing the perfect ring is very important. It is, however, the first of many expenses that are sure to follow with wedding preparations. Carefully consider your financing options and whether you can afford such an exclusive designer ring. Also factor in the cost of insurance. Insuring the ring is a very wise decision that will give you peace of mind and confidence every day. Cartier operates several bridal boutiques in major cities around the country. Getting personal service and expert advice is a major asset when choosing a ring, and scheduling a private consultation at a boutique takes the pressure off of making a decision all by yourself. You can also order a catalogue online to preview their complete line before shopping in person. Like many other jewelry companies, the Cartier website is also a valuable resource to consult before making a purchase. The website allows you to custom-design your own ring and see a preview of what the ring will look like and how much it will cost. It also suggests similar designs and suggestions for alterations based on your preferences. Don’t forget that you will also need to purchase a wedding band in addition to the engagement ring – the website can show you bridal sets or complementary pieces to coordinate. When shopping for a Cartier engagement ring, you should also consider other Cartier wedding accessories. Custom-made jewelry can be created in less than a month, and matching jewelry ties it all together. Bridesmaid and Groomsmen gifts are also available, as well as high-quality luxury stationary. You cannot possibly express all of you love through one circle of metal, but at the moment you go down on one knee and take the leap of proposing, you can be confident in the color and name of Cartier.